This is my son’s fully loaded dump truck! One of the really neat things about being a parent that no one tells you about is that you can look at your child’s toys, or clothes, or artwork and have sentimental feelings come rushing back to you. Every toy tells a different story. One of my son’s favorite toys was one we weren’t expecting to buy for them. He was still young and Easter was coming up, so my wife and I wanted to buy him an Easter gift. We were expecting to buy him some type of block set, but instead we ended up with the Mega Bloks Building Kit Dump Truck (I think the official name is the Mega Bloks CXN67 First Builders Dump Truck Set Building Kit – but I’m not typing that multiple times). As soon as my son laid eyes on it you could tell he really wanted it. He got so excited, probably because it combined a truck and buildings blocks. My wife and I knew there was no way we were leaving the store without that being his Easter gift! Two years later and that dump truck still see a lot of action. It has been through many wrecks and had many fictitious adventures, but it still remains a favorite in my house. The dump truck is awesome. It is big, yellow and red, and even has a little toy driver. The wheels are also big, but move well on all terrains…you know carpet, tile, even hardwood floors. We have never used the toy outside, but it would be perfect for a sandbox. The back of the dump truck does lift up, allowing for you to dump the blocks or whatever you are hauling. A 1.5 to 2 year old should have no problem using this feature, it is not super sticky or hard to lift. What probably drew my son to this toy was that it also came with a set of 20 mega bloks. It is a perfect starting collection if you do not own any other giant Legos or mega bloks, or it can seamlessly be added to a current mega bloks collection. The dump truck does have some built in groves where you can build towers and things with your blocks on the dump truck itself. I believe the driver is removable from the cab, but we never cut the strap that holds him in. Minor parenting hiccup. The recommended age for this toy is 1-5 years. This seems accurate to me, although I think kids will keep playing with it past the age of 5. The dump truck is over a foot tall, so depending on how big your 1 year old is, it may be difficult for them to handle. The dump truck is surprisingly light. The manufacturer says it weighs 4.2 pounds, but that must be with all the blocks fully loaded in the back. My son was always able to lift it up and carry it around if my memory serves me correctly. 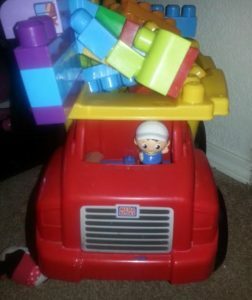 It goes without saying, but your child is going to have fun driving the truck and building with the blocks, but they will probably have even more fun hauling random toys around and causing giant car crashes. My son loves it, making it an easy toy for us to recommend. Like always, let’s take a quick look at the potential dangers this toy could create in your household. The obvious thing that is going to cause the most pain is the dump truck being rammed into things. If your child is high energy, or as we like to say spirited, you know they are going to crash into things. Some of those crashes will be accidental, you know, them running to fast with it and not looking where they are going. Other wrecks will be on purpose, hopefully into furniture or block forts and not into people or pets. But these are the predictable dangers. I was truly surprised at how safe it is overall. My son has actually sat in the back dump truck part and never had an issue. When younger, you do have to watch for them actually standing in the back, because the wheels could move causing them to spill out. We don’t recommend children standing in the back, so keep a close lookout for this. My son will also lift up the dump truck part and sit between the cab and the lifted back part. This actually has caused zero problems, and it speaks well for the toys durability when a 30 pound child can sit on it like that with no issue. Overall, you have the predictable potential problems that are easily preventable if we teach our kids not to do them. So realistically, natural consequences will kick in the first time they do anything we as adults would consider stupid – and hopefully they won’t do those things again! For those reasons, we give this toy a 4 out of 10 on the danger scale. How Annoying is it for Parents? There is almost nothing to complain about for parents. The toy doesn’t make any annoying sounds. It is really durable so you don’t have to worry about breakage. It is a toy your child can play with independently. 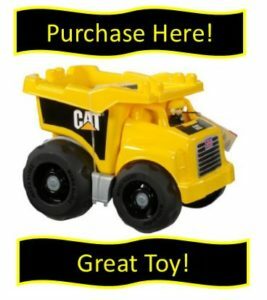 They even have multiple things they can do with the toy like racing it, loading it up with other toys, or even just building with the blocks it came with. I guess my kid rammed my legs with it a couple of times and chased a cat with it. But in the grand scheme of things, I don’t think those are a big deal (although my cat probably disagrees). We are going to give this toy a 2 out of 10, and we probably could have gave it a 1. 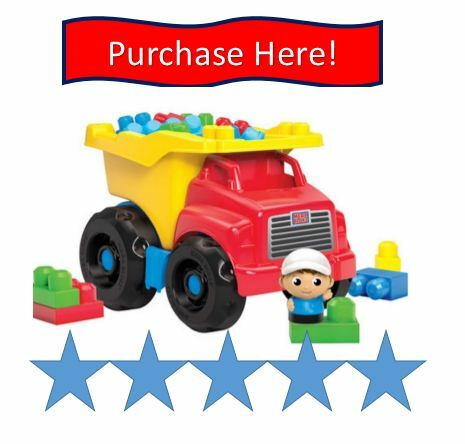 There are numerous variations of this dump truck available for purchase. 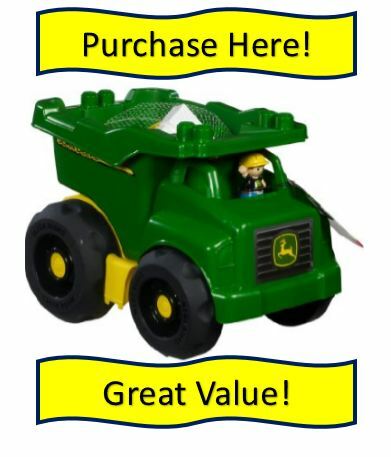 For example you have a green John Deere version and a yellow and black Caterpillar version. If you like a different color scheme, or as a parent you really like John Deere or Caterpillar, feel free to pick one of those variations. I would encourage you to make sure it comes with the blocks, I think they are an important part of the overall toy experience. There are also some miniature dump trucks available. They are similar in looks, but they are just much smaller. Those would be good outdoor toys, but part of the fun of this toy is having the ability to load it up with many other toys. I really have no complaints with this toy and boys and girls are really going to enjoy driving it around, hauling loads of toys, and getting into lots of mischief. We give this toy a gold star rating, and I think whoever you buy it for is going to have as much fun as my son does with it! If you potential gift reciever is more of a train fan, I would recommend looking at some of our toy train reviews!